Sixty years ago this past summer, a caravan of army vehicles left the nation's capitol for California on a trip that played a role in the creation of today's interstate highway System. As a result of that mission, today's interstates combine design elements to meet both military and civilian needs. President Wilson dispatched a young lieutenant colonel named Dwight D. Eisenhower to serve as official observer for the expedition. His assignment: determine the time required for such a transcontinental trip and gather data on road conditions along the way. 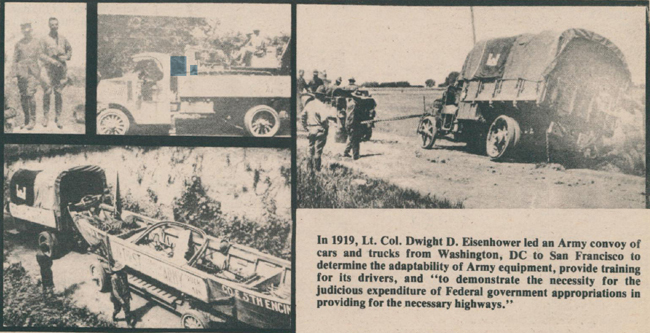 Just before noon on July 7, 1919, the 73-vehicle convoy lurched forward on solid rubber tires from Zero Milestone near the White House, destined for San Francisco. "Sixty-two grimy, exhausting days later, the welcome sight of the Pacific Ocean came into view," eyewitnesses recall. "The 3,251-mile journey was over, and Ike's journal was full." Mud and mountains had challenged the convoy's passage. Eighty-eight bridges could not bear the load and had to be rebuilt or repaired before the military trucks could pass. Roads had been erased by flowing sand or were simply non-existent for miles at a stretch. Eisenhower, having experienced first-hand the deplorable conditions of our nation's highways, and later having observed the German Autobahn during World War II, was convinced of the need for a comparable highway system in the United States. In 1956, as President, Eisenhower signed into law a bill providing long-term funding for the "National System of Interstate and Defense Highways" — what is now called the Interstate System. On today's Interstates, trucks can carry commercial goods or defense cargo from Washington to San Francisco in 65 hours, covering as many miles in an hour as Ike's troops did in an entire day. Few people realize that the purpose of the Interstate highway system is not just for civilian convenience, but also to help move workers and goods to and from production plants and to move military personnel and equipment in time of national emergency. Even fewer people know that many design characteristics of the system were included with defense functions in mind. On the autobahn, Gen. Eisenhower observed that controlled-access highways enabled convoys to move along without the need to post road guards at intersections every few hundred feet. So, the Department of Defense requested that Interstate planners allow for limited access throughout the new system. Covered bridges provided unique obstacles to the 1919 convoy as it traveled throughout Pennsylvania. Nobody had thought to measure overhead clearance until truck tops splintered bridge roofs and crushed the bows holding up canvas tops. Today, at the request of the Defense Department, Congress requires a 16-foot vertical clearance for all overpasses built on the Interstate system. Military transportation officials are just as concerned about the Interstate's 12-foot lane width as vertical clearance and bridge strength. The Air Force's Minuteman intercontinental ballistic missiles are moved to and from their silos on ''transporter-erectors" which are 10 feet wide and nearly 14 feet high. And civilian motorists benefit because the Interstate's 12-foot lane width is a significant safety factor since it allows more room for emergencies such as skidding and blowouts.